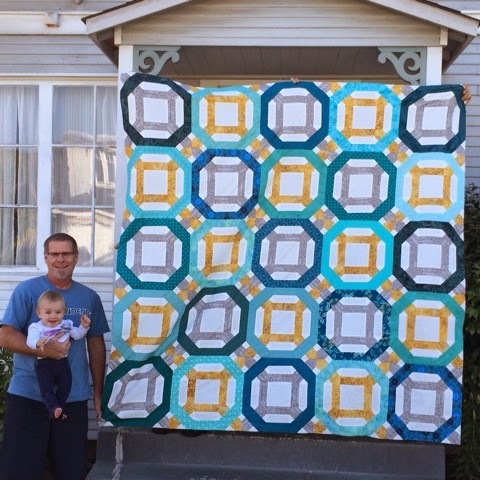 Finished and uploaded on the MQG Community site just under the wire are my two Michael Miller MQG fabric challenge entries. I named them Companions #1 & #2 because they are similar but different, related but not the same which kind of reminds me of our two dogs. I had hoped for a real photo shoot but settled for the helping hand of my son as he headed out. We've had super sunny skies resulting in a washed out appearance - where's the fog and overcast when you need it? Linking up for 2014 Q3 FAL finish and you can see this post where I set my GOAL. 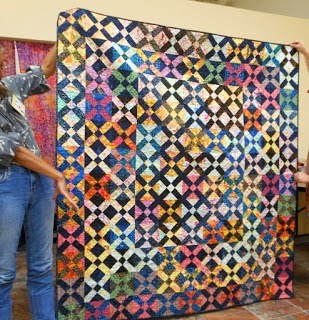 If you're a MQG member take a look at the amazing variety of quilt designs that are pouring in. 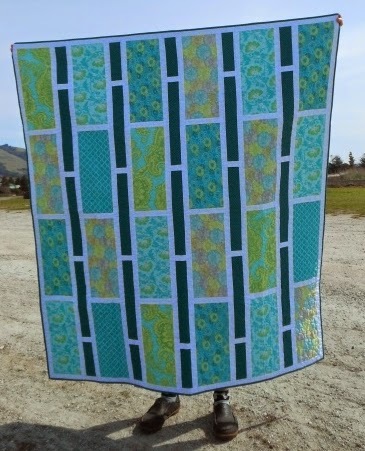 For the backing, I had in my stash Michael Miller dots in the two color ways that I thought featured the best of the fronts, teal and green. The binding is scrappy strategically placed. Usually I block off the living room and keep the dogs out while I spray baste. But this time, the tops are so tiny and it was only going to take a minute. Well, I turned my back and this is what I got! Good thing he's adorable and that it's washable. If you're wondering why I made TWO entries, let me remind you that it's one less than I made for the Madrona Road challenge with No Inherent Sense of Direction, Driving in Circles and the Bed Runner. My Ottlite isn't fueled by actual oil I know, but the glow of it and the hands on the clock (yes, I know they don't actually have hands anymore) reminded me of the saying. Hubby is hoping to install an LED strip right above my workstation this weekend, fingers crossed. Top complete! 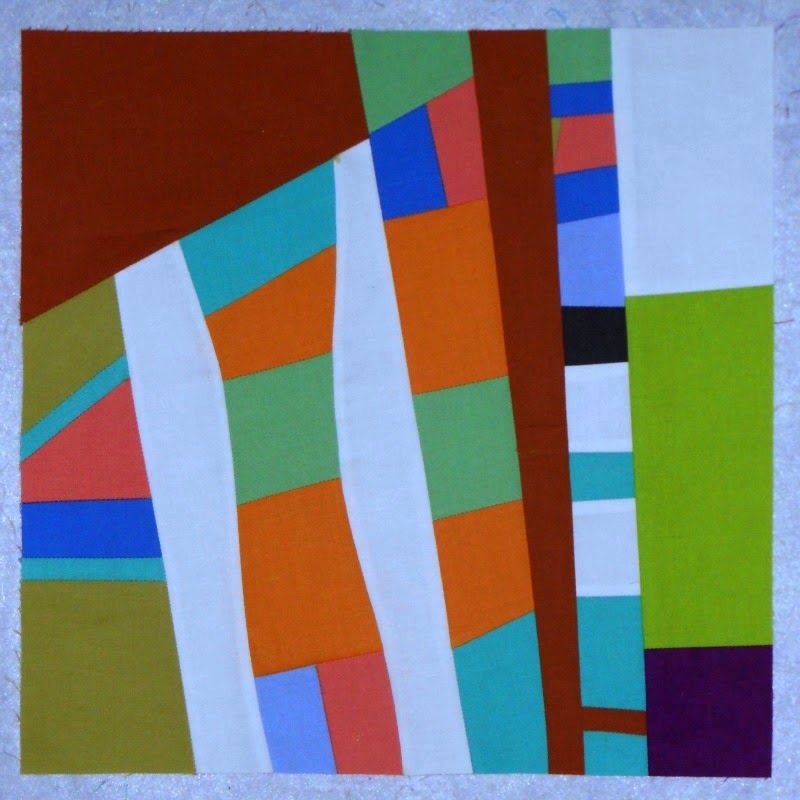 I'm thrilled with my version of #greekpluspussquilt. Pattern testing for @r0ssie_fmq has been fun. I couldn't help but put a bit of my own twist on the layout. 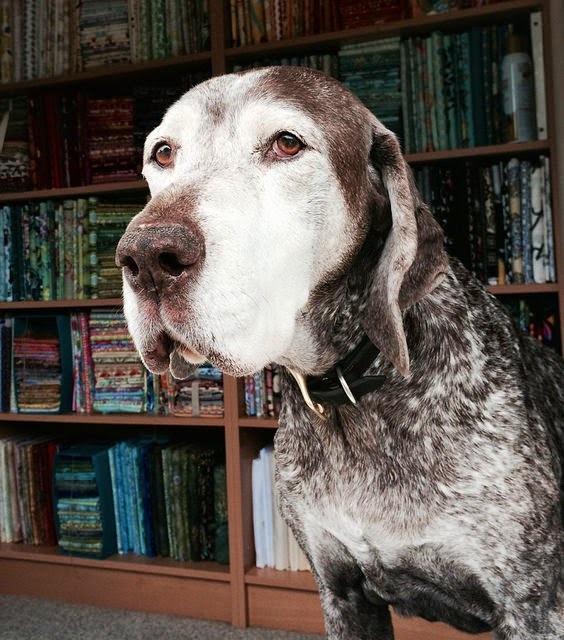 She'll be releasing her pattern on etsy and Craftsy August 4th. I've got to dash off the spend the day at a Jacquie Gering (Tall Grass Prairie Studio) workshop. 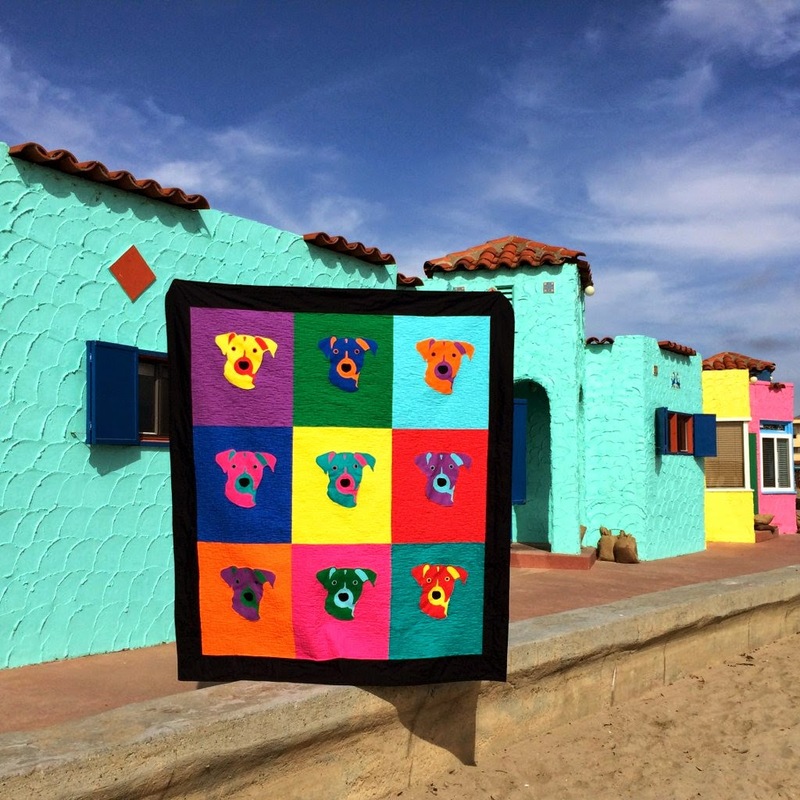 Her QuiltCon class sold out in a blink but thanks to SBAMQG, she's come to see us! 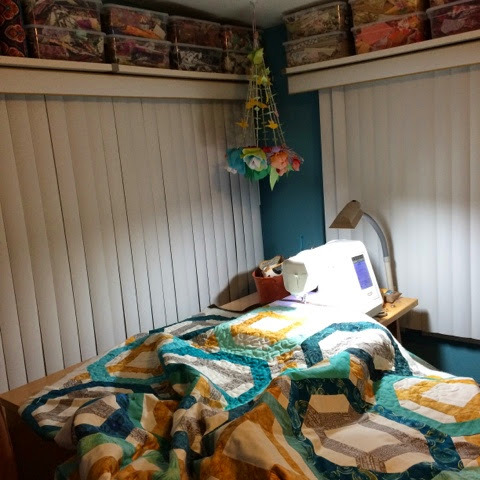 When I wrote yesterday's post for Plum and June's Let's Get Acquainted blog hop, I realized my sewing room photos I had to use from my major Re-Do last year were pretty outdated. So I tried to get a current picture of my stash shelves and had to go into the backyard and shoot from outside an open window (cuz, yes my sewing room is that small). Chase has always been the camera shy one and Dottie the photobomber - not anymore! I had to go double deep on the shelf this time with my bundles and did a bit of regrouped by general color theme. 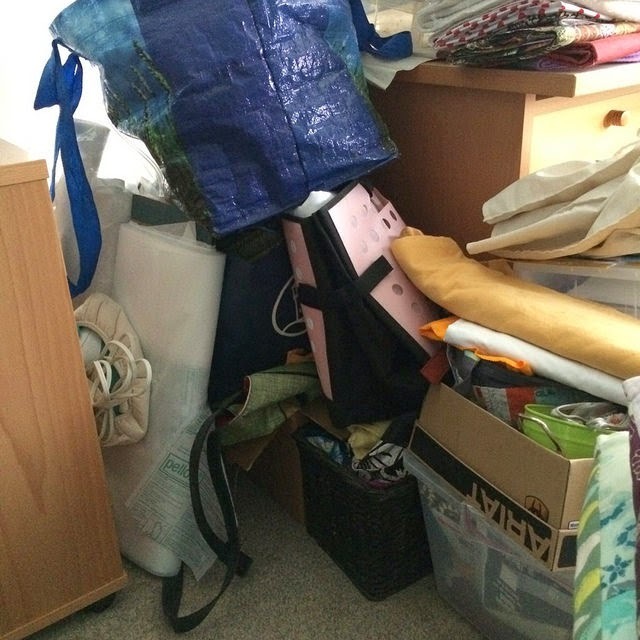 There's a ridiculous amount of fabric but it has stayed relatively sorted for as lazy as I tend to be about filing things back after my workshops and sew days. Even though I knew it had to get worse before it got better - ugh, stepping over and around this mess as I cleaned up was pretty bad. Bags of bags and buckets of who knows what! It's not done yet but it resembles hoarding a bit less. 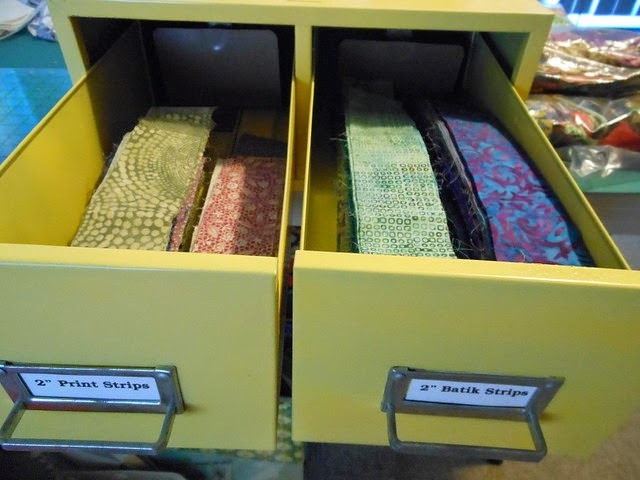 My Sewing Room is one big WIP and deciding what gets to stay and what needs to go is SUPER difficult for me - but I'm committed to making an effort even if it means ditching my "Flat and Happy" yellow library card cabinet. Considering I downscaled my stash and scraps thanks to the recent Yard Sale and Flea Market put on by my two local guilds I'm feeling a little more in control. 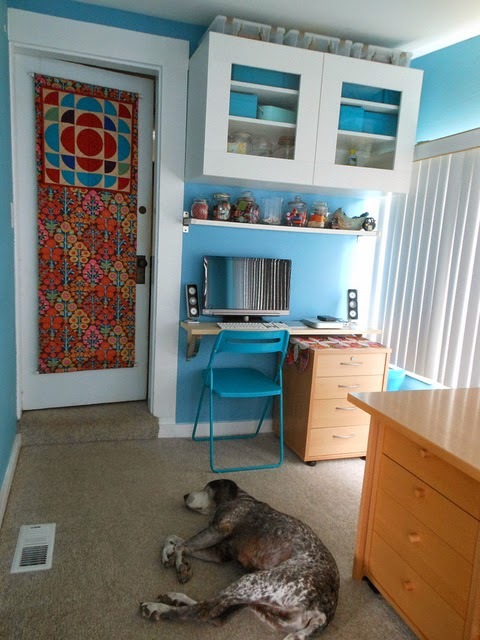 The big push came during my long 4th of July weekend when I decided to declare Freedom from Clutter. 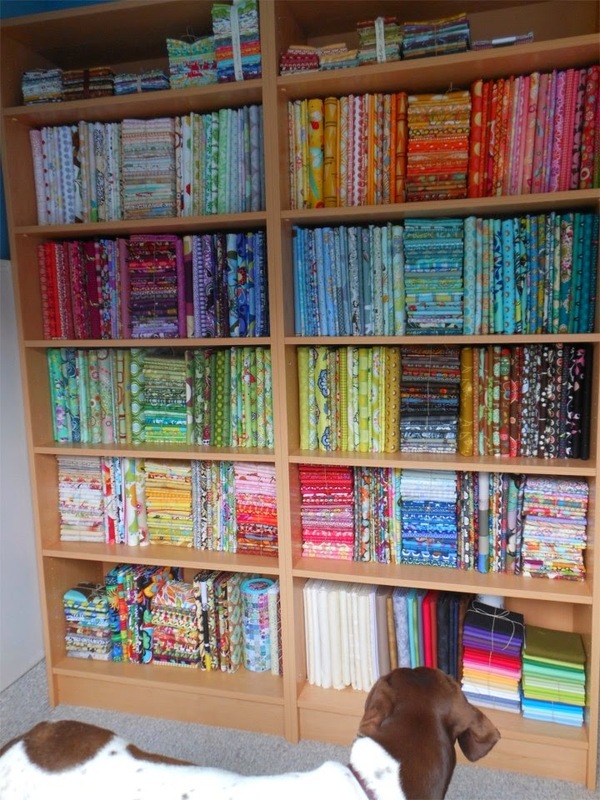 I'm also hoping to participate this year in the Where I Sew link up at Pink Chalk Fabrics. It's so much fun to nose around other people's space don't you think? Wish me luck getting the place camera ready. If nearly three thousand pictures in my flickr pool seems extreme, it's because I also upload photos from our MQG guild meetings and special events plus some are private so i can store them for my own reference. There's a bit of clutter and chaos in my virtual world too. I've tried really hard to make some sense of them by creating albums, including monthly and yearly projects, but maintaining them isn't really my forte. Any advise on keeping on top of things? Linking up to Finish it up Friday has been absent for quite some time but tonight I pulled it off with the completion of my Michael miller mqg challenge. Tomorrow in the light of day I'll get a better picture on a background less distracting than my bed so I can post it on the MQG Community site. 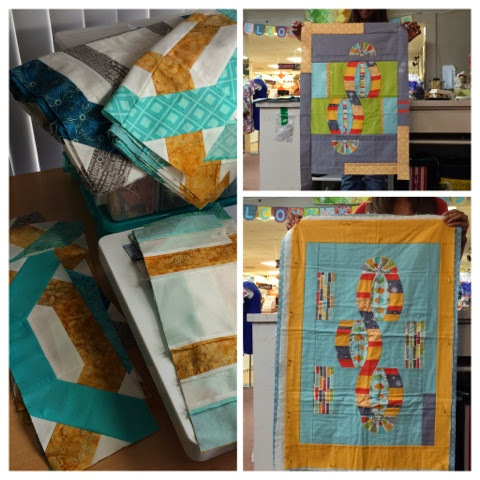 Linking up to Finish It Up Friday with Amanda Jean at Crazy Mom Quilts. It's been wonderful to have so many new visitors to my blog and all the comments make my day. 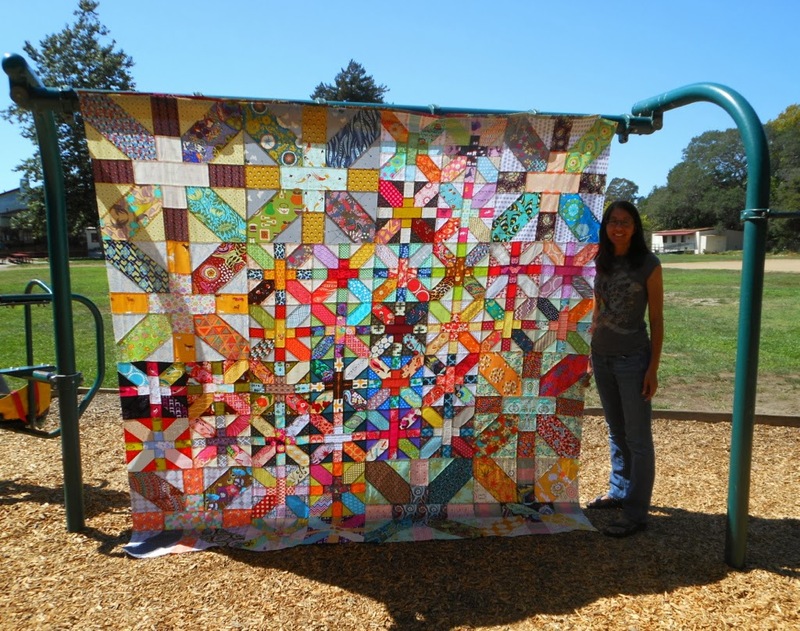 Be sure to visit the 2014 New Quilt Bloggers Blog Hop. Beth has a master list of links to make it easy on you. You'll find me at the very very bottom - Yup - last but not least! 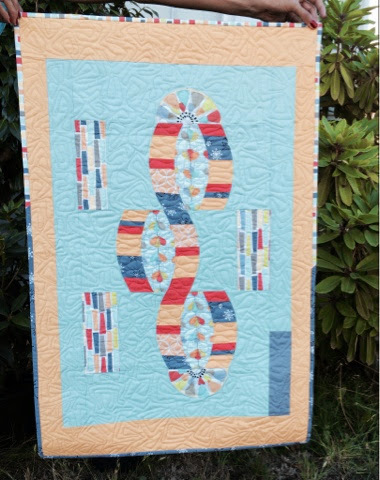 Welcome to my stop on The 2014 New Quilt Blogger Blog Hop at Plum and June. Thank you Beth for including me in this an amazing series. Let's Get Acquainted! Hi There! I'm Karen, flickr and IG known as CapitolaQuilter - because I live in Capitola, California. 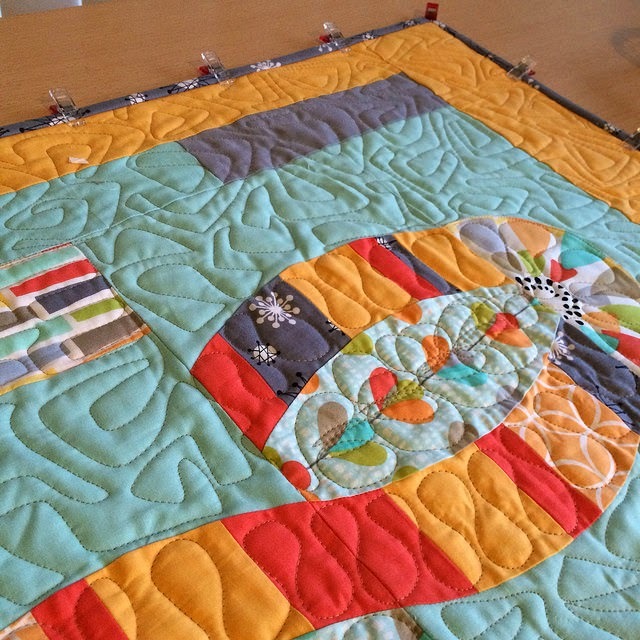 It use to read: capitolaquilter and was constantly mistaken for "Capitol A Quilter" so rather than rename myself I opted for this fix and it seems to have done the trick. 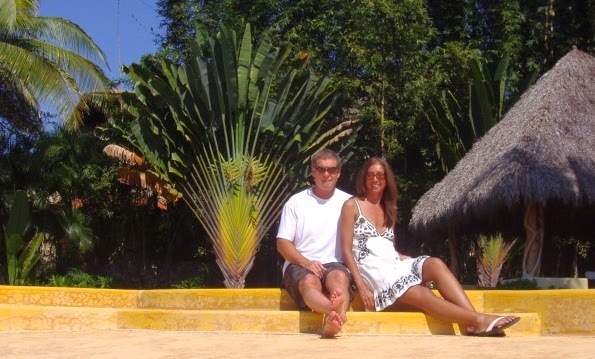 Hubby and I celebrate our 31st wedding anniversary this month - more than many readers have been alive , I know. We have two grown sons and an adorable granddaughter. 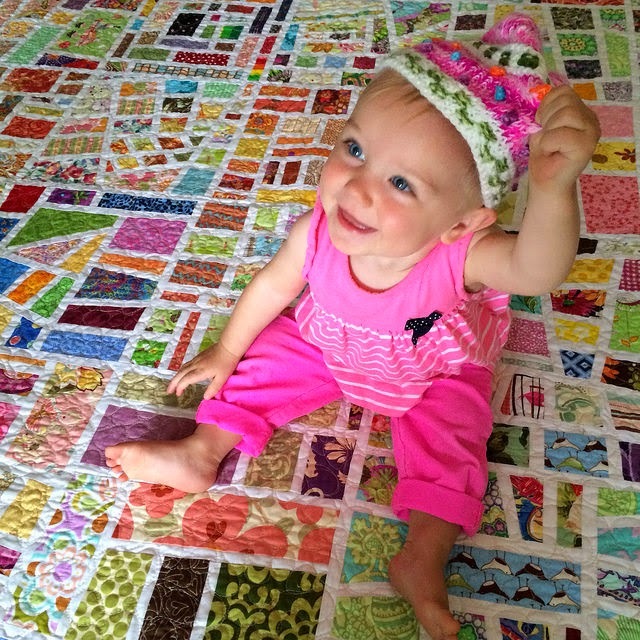 She's featured often on the blog posing on many different quilts. They've gotten much more use than ever before although she now crawls right off them. 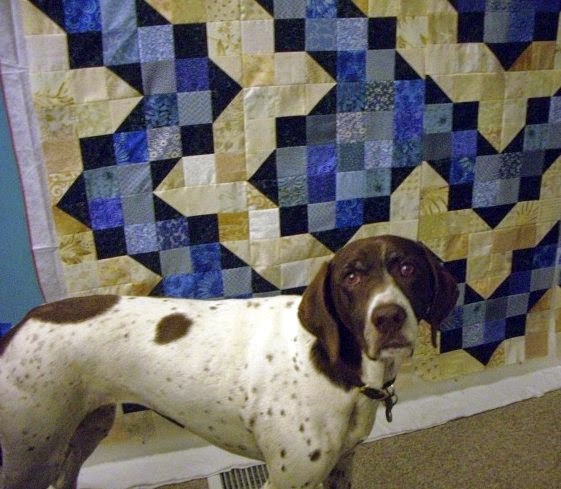 Always underfoot in my sewing room and frequently photobombing are our German Shorthair Pointers who we rescued 12 years ago. 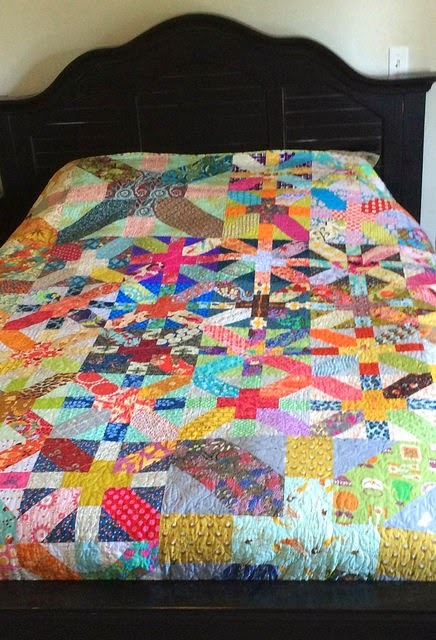 Although my mom never quilted, she did sew while I was growing up and taught me how at a young age. I use to sew my own clothes and made my boys some outfits but nothing too much recently. 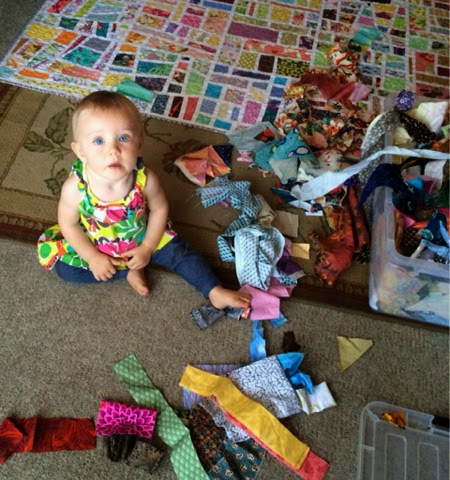 Before attending Sewing Summit in 2012, I decided it was only fitting to start a blog. 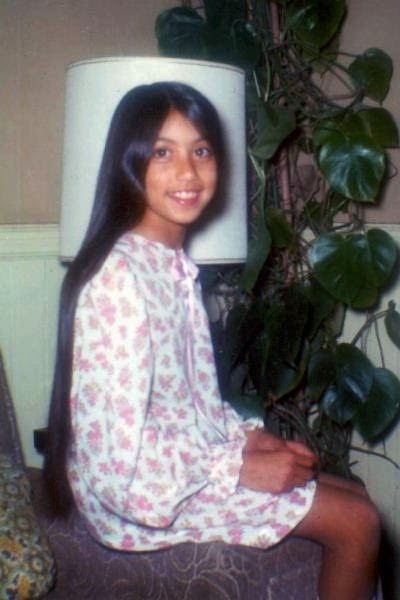 I've added an About Me Page with a bit more of my backstory. 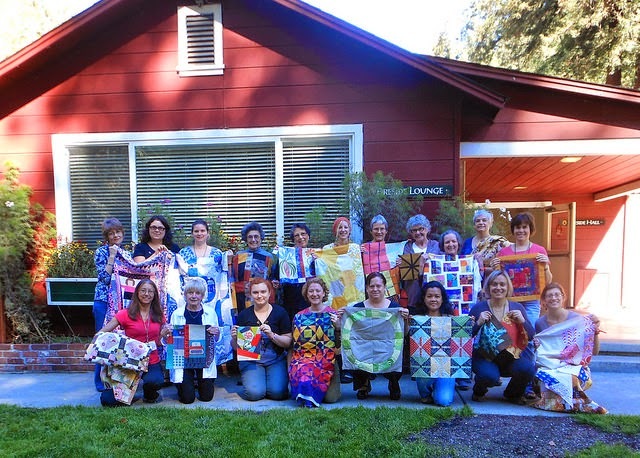 Collaborative projects and social sewing are among my favorite things to do. 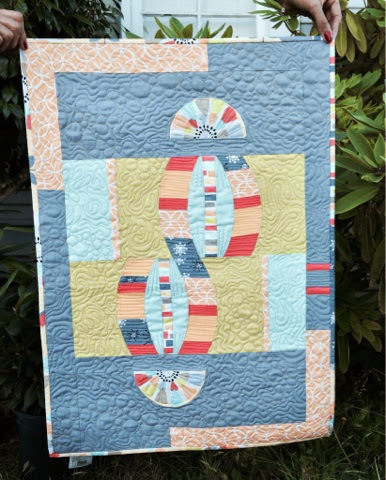 My design style is evolving but I can say with certainty that I love to work from my stash and incorporate scrappiness. 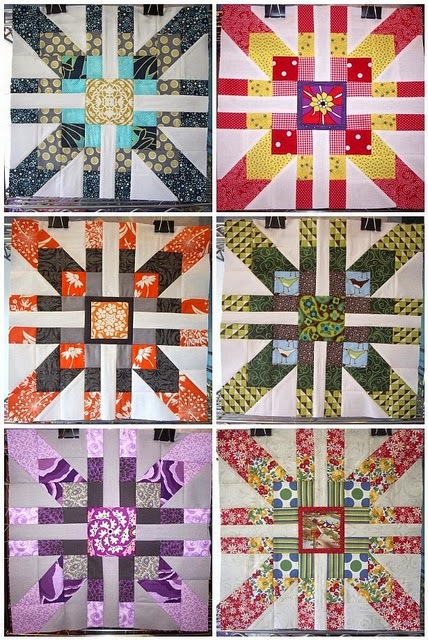 Here are a few of my favorite quilts (including my latest finished top) to prove I can also be matchy-matchy. 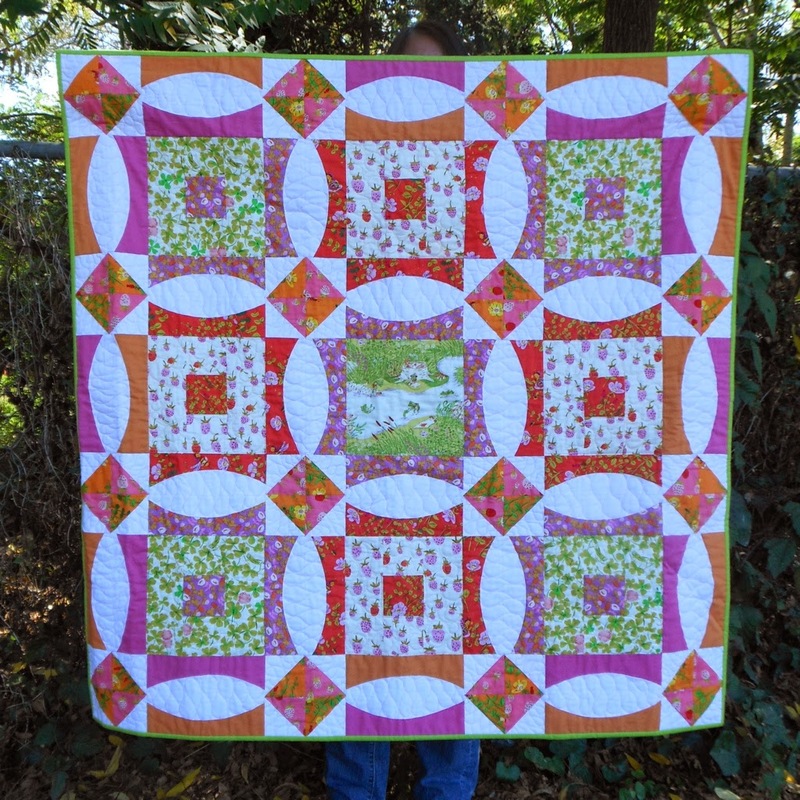 Finished and entered into Blogger's Quilt Festivals where you can read all about them are Catalyst, Ring Around the Briar Rosies, Old Italian Block, Giant x-Plus, and Tassels. The melding of traditional with modern elements appeals to me. There's a pretty big span of projects over the years. 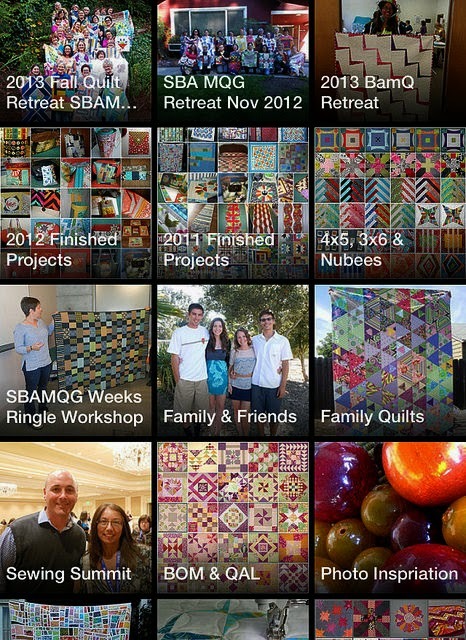 Since I've been sewing longer than blogging and still like my old ones, I included a Quilts & Creations and a Pre-Blog tab too. I'm not a purest or a perfectionist. Mixing batiks, traditional and modern fabrics is all good in my book. 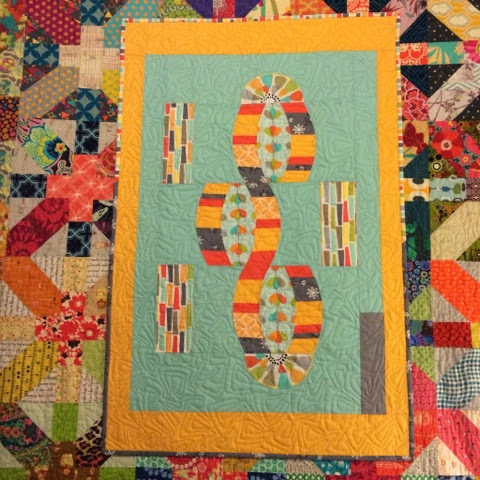 Block swaps and Bees have given me cherished memories and awesome quilts for my bed. Not many, but I've written a few Tutorials. They're harder to make than I thought ! It's a bit ironic that my Polaroid Chain Pieced attracts more traffic to my blog than anything else and yet I've never gotten around to making anything with my swap blocks. 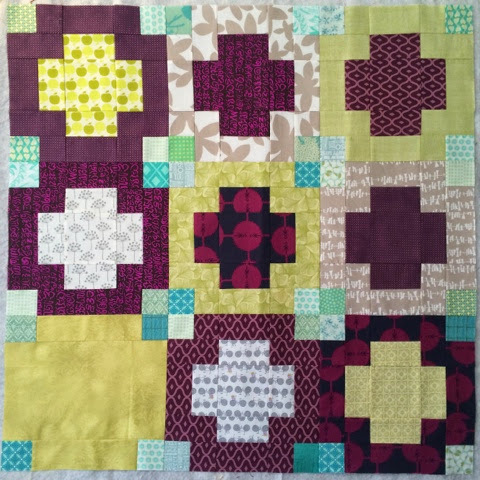 Another thing I like to do is give a pattern a bit of a twist to make it my own like this 12 1/2" variation of Lee's Supernova block (how to) I adore pure Improv. 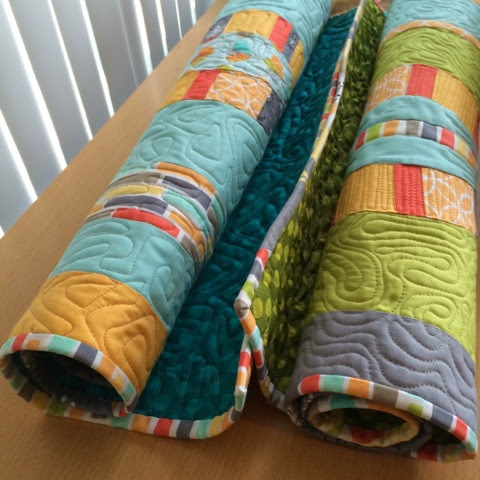 When I free motion quilt I have the same take it as it comes attitude. It's a task that takes the right frame of mind which can be difficult yet rewarding. Let go and go for it. Guess what I did? 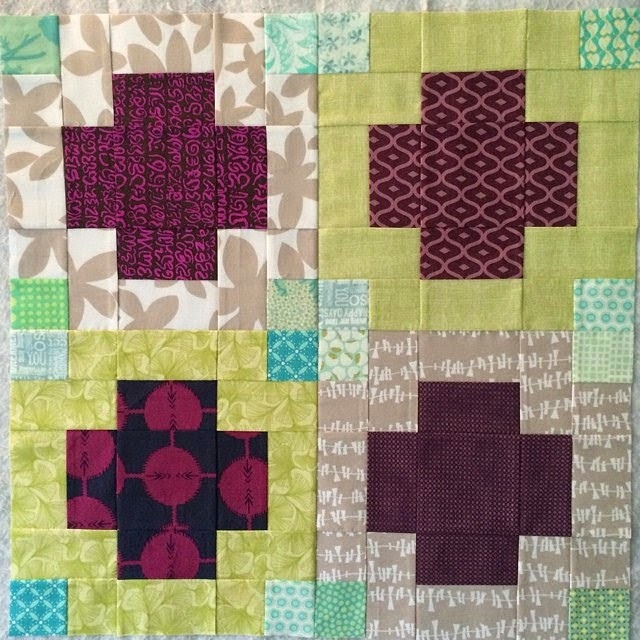 Yup, dropped everything and jumped on board something new that caught my eye this weekend with these four test blocks sewn up #greekpluspussquilt for @r0ssie_fmq. 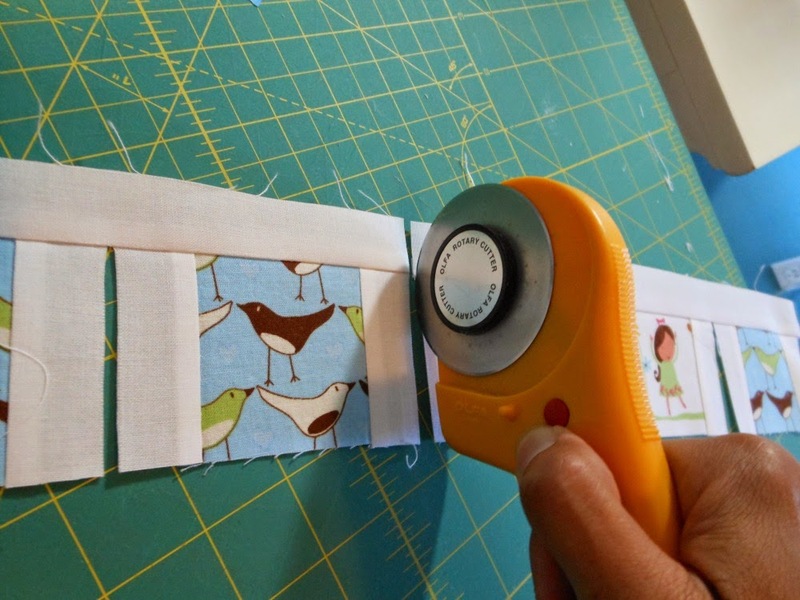 #1- Let yourself get distracting and sew what you want when you want and ditto for blogging. #2- Trust your gut. Applies to quilting as well as life. QUESTION for you - Are you happy when you're scrappy like me? I'd love to know and if you'd like to follow me, that's great too. You can find links to the entire line up HERE and the very useful series Advice and Tech Help for New Bloggers HERE. 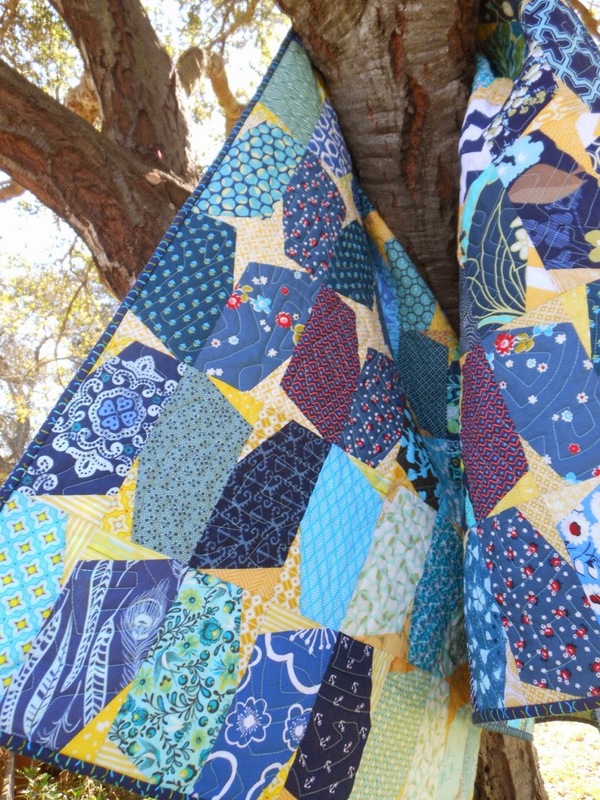 Ever since my boys were little they have had the honor (or chore depending on who you ask) of holding up my quilt tops on the front porch as soon as I finished them. 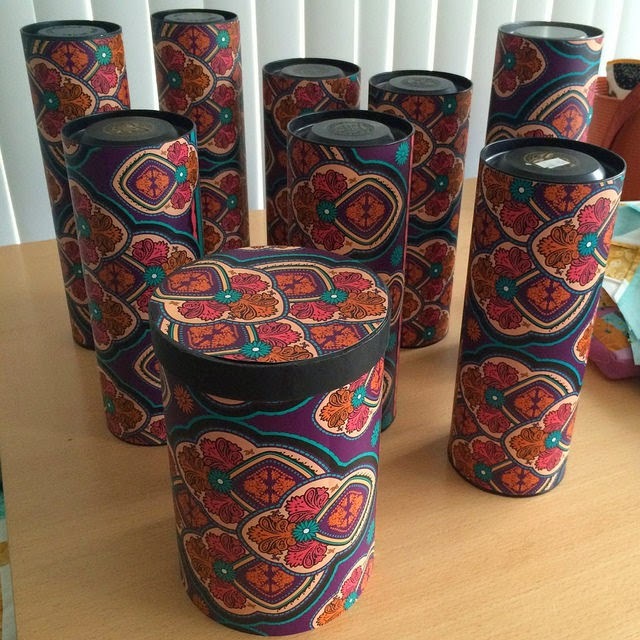 I wrote about our tradition in this Duck and Cover post shortly after starting to blog. Well now that they're around less frequently the classic porch shot has become less of a regular thing - sad face. Today I got lucky and caught them both, just like old times. 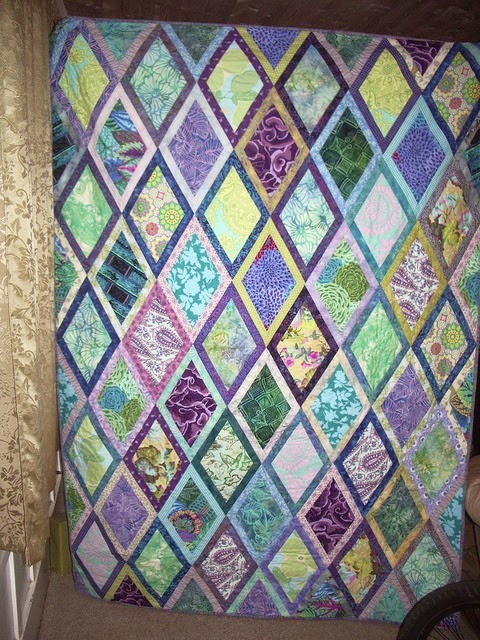 It feels fabulous to have made progress on the Chain+Link wedding quilt for my niece. Training my granddaughter early, she helped hubby with the billow of the breeze. 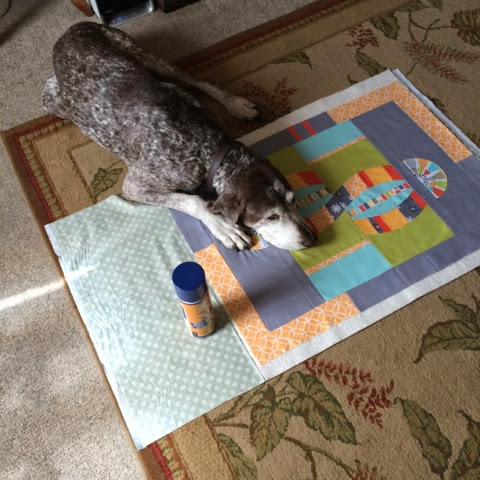 I also enlisted her assistance earlier this week with my prep for tomorrow nights annual flea market at our local guild. 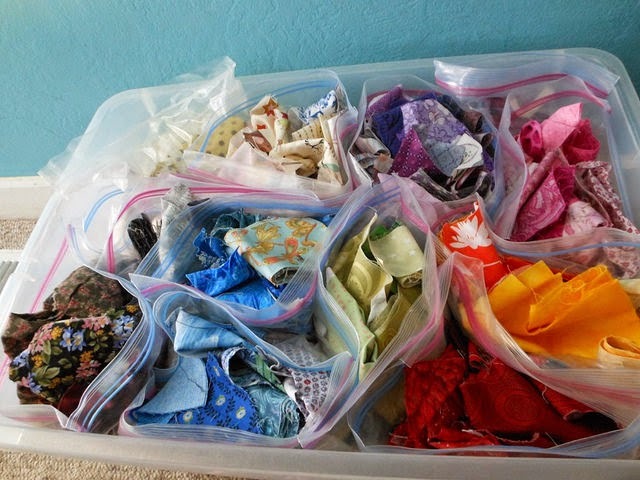 A few weeks back our MQG had their very first yard sale and I purged quite a bit but realized after the fact that simply put: I have a ridiculous amount of scraps. 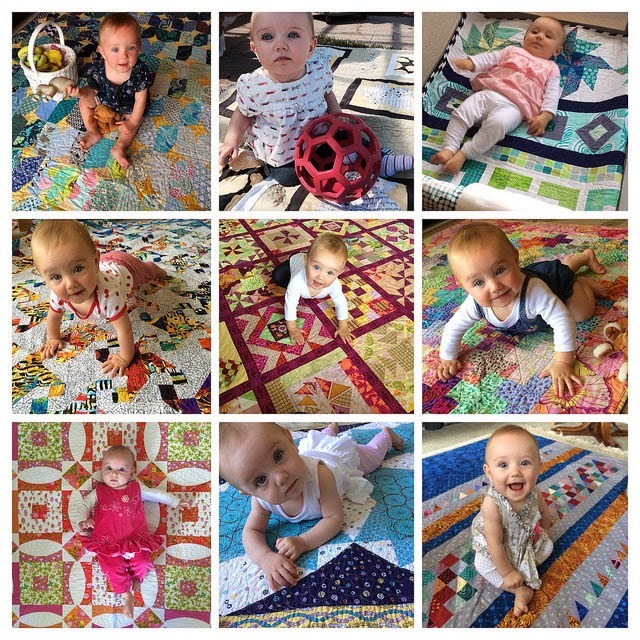 It's hard to part with potential especially ever since making the mod mosaic quilt seen behind her on the floor. We had to move off onto the carpet to keep our visual sanity. I'm pretty new to IG but am finding the "drop everything" immediacy of it kind of appealing. 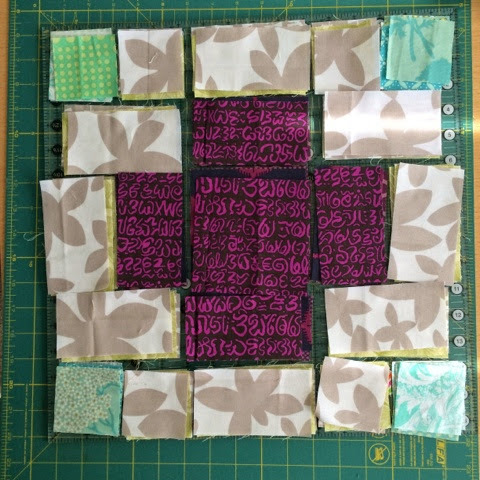 After diligently chugging along with my other projects lately, I think I earned the detour that my afternoon took when I saw a message from @r0ssie_fmq Rossie Hutchinson that said "Pattern Testers Needed". 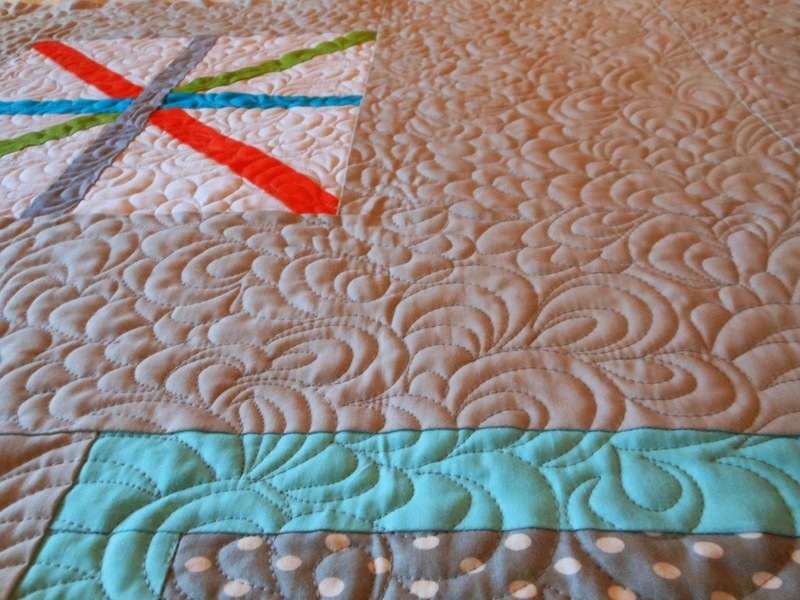 Her modern mash-up #greekpluspussquilt with it's scrappiness caught my eye and captured my heart. 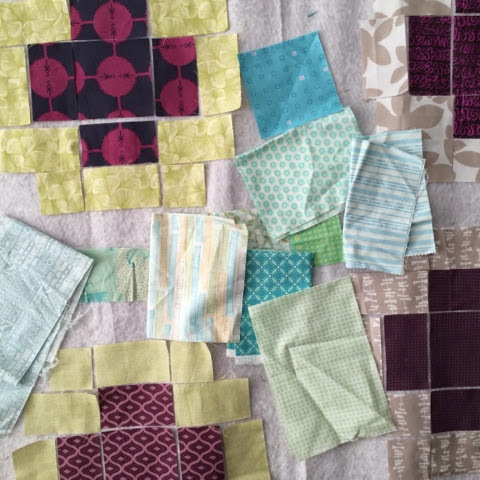 Sewing on whatever-I-darn-well-feel-like has always been the way I roll (hence my last post confessing to zero completions for Finish along quarter 2). Not sure I will carve out more time than the 4 blocks in the works but it sure has been fun. She'll be releasing a pattern August 4th available on etsy and Craftsy. 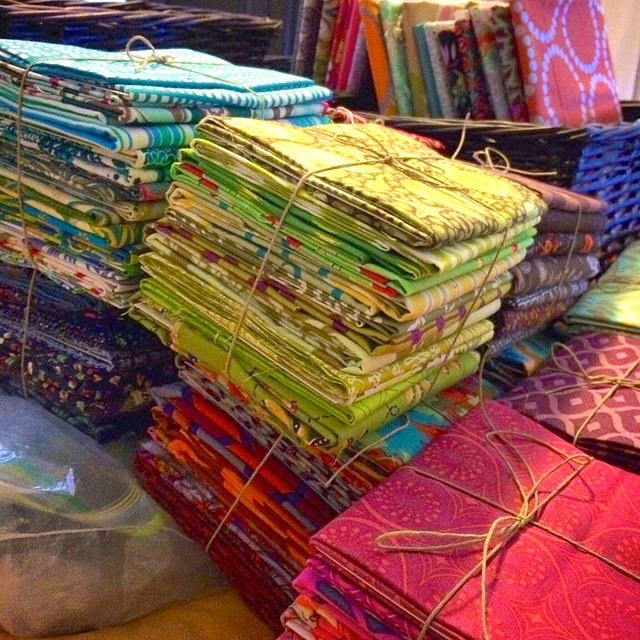 The hop continues so be sure to visit Plum and June for week #3 links along with a fabric giveaway. 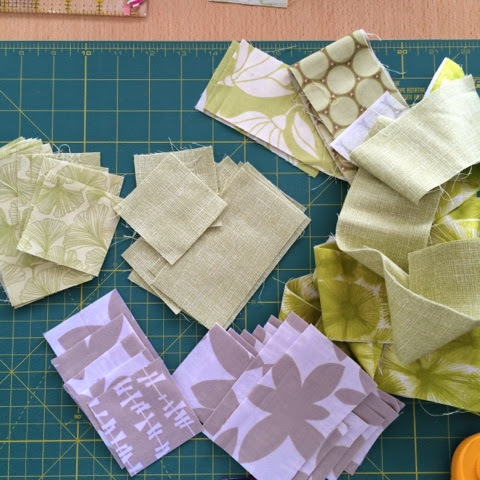 I'll be joining in during the next round so I hope to see you back to hear all about me and my blogging and quilting tips. Until then - happy stitching! I have been participating in FAL since January 2012 where I linked up 3 item. Since then I seem to repeatedly bite off more than I can chew linking up two or three times that with mixed results. 2014 Q2 was my low point- Yup. Zero out of ten - my first Shut Out that I recall. The group is fun and Katy at The Littlest Thistle very entertaining with her Good-Bad-and-Ugly Stats keeping us on our toes. Linking up to 2014 Q3 Goal Setting Party - hope you will too. The other revelation is that I need to improve my blog tags for searching because I couldn't find my 2012 results post. I know that they all got finished so I guess that's what matters.